Note: The figures showing revenues and costs for UPX have been corrected as of 12:35 pm, June 30. A section on future ridership requirements vs operating costs has been added. Updated 5:30 pm June 30, 2016: Due to conflicting information in the Metrolinx Annual Report, it is possible that the level of subsidy per rider has been overstated in the original article. Pending clarification from Metrolinx, I have added a separate version of the calculation taking into account both sets of figures. Also, the three days in February 2016 cited originally as “missing” were actually free days and these were not included in Metrolinx counts to avoid skewing the averages. Similarly, reporting “zero” for these days would skew the averages. Therefore, the approach taken below of using the previous week’s data, during a period of little change in ridership, allows the moving average and overall trend to more accurately reflect what would have happened in the absence of the promotional weekend. Updated 5:45 pm June 30, 2016: Metrolinx has confirmed that there is an error in their Annual Report. Metrolinx has published the ridership for the Union Pearson Express up to the end of May, 2016. The daily counts rose dramatically once fares were reduced on March 9, 2016, and the values are running well above the original projections after a long period of poor performance. Exact origin-destination counts are not available, but Metrolinx reports that about 80% of travel is to and from the airport while the remainder are trips between other stations on the line. Note: In the source data, values are zero for February 13-15, 2016 as this was a free weekend for promotional purposes. The values from February 6-8 have been substituted for continuity. Total ridership to March 31, 2016 (the end of the fiscal year) was 751,500. The revenue situation for operations up to March 31, 2016 is revealed in the annual report. Budgeted revenue for UPX was considerably higher than actual. There are two separate sets of figures in the Annual Report related to the subsidy. One claims that the subsidy paid was $63.2m while other shows this value as the total operating cost of UPX. This leads to different calculations of the per rider subsidy. For completeness, I have left both calculations below pending clarification from Metrolinx. Metrolinx has published both the total revenue and the total cost for UPX, and from this we can deduce the operating subsidy. With a total cost of $63.2m for 10 months’ operation, an annualized value would be about $76m. If the average fare falls to $10 (half the level with the original tariff), then 7.6m riders would be required to break even. A break-even situation is not in the cards for UPX, and it will continue to drain subsidy dollars from other more widely-used parts of GO operations. Yes, just over 1/4 of the subsidy paid to Metrolinx went to support the UPX. This does not include any capital amortization which is provided for separately. With a total cost of $87m for 10 months’ operation, an annualized value would be about $104m. If the average fare falls to $10 (half the level with the original tariff), then 10.4m riders would be required to break even. This entry was posted in GO Transit, Transit. Bookmark the permalink. Is there a forecast for the revenue/subsidy situation (total and per-rider) based on the recent (post-fare-reduction) ridership numbers? Back-of-the-envelope, I’m seeing about 7400 riders per day in May, up from 2000-2200 in December and January; looks like a three-fold increase. If the average fare is one-half what it was, then that works out to a roughly 50% increase in gross fare revenue. If the “other” revenue sources and operating costs remain unchanged, then that shaves about $8 million off the total subsidy required (about a 20% reduction, meh); but would reduce the per-trip subsidy from about $50 per trip down to a much-less-horrifying (but still-not-brilliant) $13 per trip. Steve: This is the report for the 2015-16 year. There are no future projections, nor has there been any report on the average fare now collected based on the revised tariff. Unless Metrolinx decides it is worthwhile releasing the numbers, we will have to wait until the next annual report, and hope that they still provide dis-aggregated results. I have added a section to the post discussing the ridership level needed to break even for the service. The real scandal here is that over half of the operating subsidy went to the two problem children of the Metrolinx empire: UPX and Presto. Higher ridership won’t solve the dollar requirements (much) given the lower fares, and Presto is supposed to be self-sustaining from fees they charge their client agencies. It’s no wonder they want to jack up those fees! That graph could do with two trend lines, one for before March 9, and one for after! They are going to have to raise fares at some point, if it doesn’t level off soon! Intriguing graph. When UPX opened, it took a month to reach what appeared to be a steady state or at least seasonal level. But the price drop has been followed by at least 2 months of fairly consistent growth. UPX is selling selling 4 times the tickets at half the price, which is a net gain in any case. This confirms, regardless of whether there is a price that can recover operating costs, that the original pricing was very off. If I recall, MetroLinx was aiming for about 7000 daily ridership to break even at the original fares. Since prices were cut roughly in half, the first order approximation of new break even level is 14,000 daily ridership. Assuming the last data (around 8000 daily ridership) is not anomalous, UPX has risen half of the way it needs to if it is to cover operating costs. It’s a pretty significant rise, and I hope the growth trend continues for some time. If you assume an average fare revenue of $9, they need to hit 23,855 average daily trips to break even (1,224 passengers per operating-hour or 153 per train per direction). That’s just under the seating capacity of two-car consists (158). On the bright side, when GO begins two-way, all-day service, the subsidy to UPX as a percent of the total will go down. I mathematically re-calculated based on projections and it seems just about possible that UPX trains can meet 70% farebox recovery within 3-years — roughly similar to GO. Admittedly, this was a bit of a terrible messup on Metrolinx’s side, but a very recoverable disaster, given the amazing passenger growth. Currently, it’s achieving approximately 40% farebox recovery with the new numbers now — apparently better farebox recovery now than before the fare cut. There is just about enough headroom to (when considering standees and an all-3-train fleet) to eventually approach 70% farebox recovery, especially with a bit of cost trimming given they want to reduce the management and merge with GO. Combined operating cost cuts with ridership increses, leaping from 40% to 70% farebox recovery is not too unsurmountable, assuming they can get the trains running reliably enough to use an all-3-coach fleet until electrified. At this point, this becomes roughly the same cost recovery as other GO lines. Mitigations need to occur strategically, since this is the first line supposedly to be electrified, and needs to be become part of GO RER. Another thought is that it will be very interesting to see how both ridership and fares shake out when (if) the Eglinton Crosstown extension makes it out to the airport. The UPX is a faster ride, but one wonders how much of a premium people will be wililng to pay for that speed once a direct-to-midtown light-rail alternative exists. Oh, and I calculated based on 19.5 hours, not 18 hours. The UPX trains run 5:30am through 1:00am. I also used $65M, rather than $71M as that was my cost-cutting assumption. I did hear though they are having a big pickle with the DMU reliability, preventing them from using an all-3-coach fleet. If the corridors are upgraded to CBTC, and the USRC resignalling is finally tendered properly with 30mph/45mph approaches to Union (…it’s been postponed to electrification…), then they *might* be able to increase train frequency to 12-minute or 10-minute when electrified, to help the business case a bit further, as well. It’s now 8200 riders now, according to this. 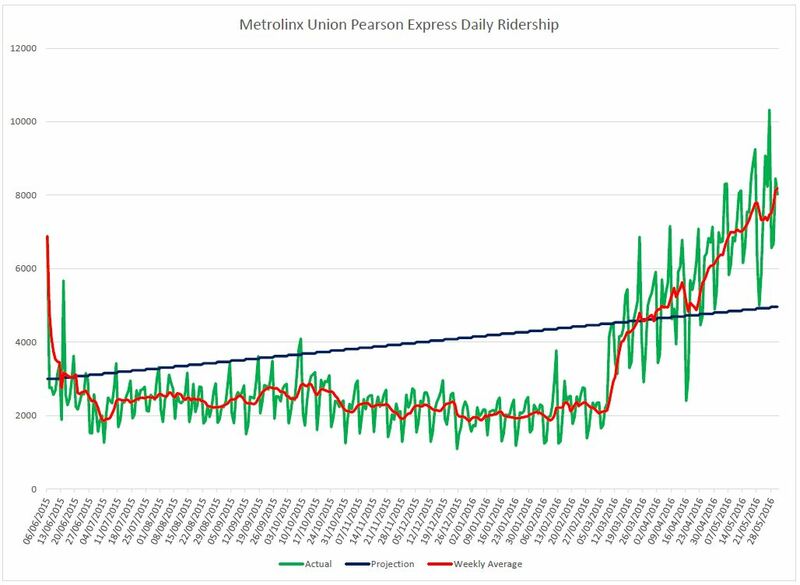 It’s clear that within the mess|boondoggle|waste (or whichever people have been saying) — the shining standout is ridership is still climbing linearly, and Metrolinx needs to capitalize on this amazing ridreship gain. It should be quite reasonable to quickly plan a mitigated success recovery via electrification, in order to preserve the reputation of the overall $13.5bn GO RER electrification initiative (+ST ‘enhancements’ like infills). Steve: That same CBC article notes that there are standees in the peak period, and there’s a basic limit on how many more “commuter” type trips UPX can carry (which have a very sharp peak compared to airport travel). Added Note: Trying to figure out the disreprecancy between my napkin calculations (40% farebox recovery, 2.5x factor) and Steve’s numbers (30% farebox recovery, 3.5x factor), I must note I excluded startup-related operating costs (e.g. the huger earlier advertising blitzes) and I calculated using 19.5 hours rather than 18 hours. But Steve’s numbers are rather close to my napkin calculations as minor tweaks of numbers dramatically swings the farebox recovery several percentage points. Regardless, correct decisions during electrification will be key. Steve: All I can say is that if UPX is counting on full trains at midnight to pay its way, they are in big trouble. Whether it’s 18 or 19.5 hours/day, trains on the margins of the service will carry almost nobody. This is typical for any transit operation. I’m not saying it’s bad, just that we can’t expect that extra 1.5 hours of operation to contribute much to the bottom line. Well, it still seems like a costly clunker and a relative waste of corridor space. On the good news side, it’s the Province/Metrolinx that gets the tab for a relative clunker vs. the City from the subways in relative sprawl. Hmm – could the TTC hire out every other train in rush hours between Union and Bloor St. as part of a quick-relief effort of the stretched subways?? It’d be nice to have seamless, or easier transfers of course, but it’s only been maybe 20 years of ideating about enabling this connectivity between the TTC and GO/RER/UPX stations, so one shouldn’t expect too much when we have obvious need, but not enough votes to get things ‘done’. Or the area is not Liberal enough for the buy-electioneerings, (seems to be tho), or it’d be too small a project. Steve: Remember that the capacity of a two-car UPX train is roughly the same as one moderately crowded subway car, and so the relief will be minimal. Moreover, until they deal with the appalling connection at Dundas West, it would not be the most convenient service to use. Remember how the folks in Scarborough grouse about Kennedy station’s RT-to-subway link? At least that’s all indoors, even if the escalators/elevators don’t always work. It’s really important when talking about any subway relief to remember just how big the capacity of a subway train and line are, and the magnitude of “relief” that is needed to make a noticeable change. UPX is now leaving some ridership on the table at peak as they don’t have enough cars to run maximum capacity, having chosen an across the board fare cut rather than one aimed at lowest ridership services (i.e. not northbound between 4.30-6.30 when business flights and European flights receive substantial trade but now commuters are piling on too). One potential short term option would be to lease Budd RDCs to supplement the Nippon Sharyo units. This would allow the Nippons to be marshalled to their three car maximum length, with 2-car RDC sets handling some off peak runs. Even refurbished they wouldn’t be as nice as the UPX units, but UPX’s glamour era ended when their President departed. As a stopgap to electrification and used sparingly, one would hope their decidedly non-Tier 4 status could be overlooked. A couple of problems with your theory. 1) The current service uses 5 trains, not 4 as originally planned and they only have 18 cars. If they run 3 car trains they have one spare train for maintenance and no “hot spares” in case something dies in service, so they can only run 2 car trains with the odd 3 car one. 2) You can’t run 4 car trains because the platforms at Pearson and Union will only hold 3 cars and Pearson is not easy to lengthen. 3) If you go for bi-level EMUs they will need the doors in the end sections over the trucks as the stations are ll high platform and the doors at Union would need to be moved. GO EMUs would have low level doors, not compatible. To make compatible would require shutdown of UPX for retrofits, not likely to happen. 4) To get any where near 70% cost recovery they would need to 3/4 seated loads on every train all day, not likely to happen. While their ridership may have gone up to 3 times its original numbers this means it is running at 30% capacity instead of 10%. When you look at those numbers it is getting better but it still is pathetic. Steve: And I might add that being packed at the rush hour is not the same as packed all day as riders on various parts of the subway network can attest. I got information someone was recently asked by Metrolinx to evaluate how the stations can be modified to 4 coach. Also, the sliding doors are not at the remote very ends, so the existing stations theoretically already can reach the first sliding door of the fourth coach, simply by readjusting sliding door location — requiring only an 0.5 coach extension of station length. You forget some cost cutting elements exist — there are some indications Metrolinx wants to merge UPX into GO. Steve: Administratively this has already happened, and they should be able to save some money in cutbacks on their bloated station staff (not to mention their now-departed president). This would be offset by some costs related to operating longer trains or more frequent service. You are right on the difficulty of coach availability though, on running an all-3-coach fleet. Again, all of what I said are expensive modifications, but Metrolinx must do them, given the apparent pressing need to make UPX part of Toronto’s transit system at this point. Also, earlier and later trains are gradually being packed as ridership goes up but I still see UPX as of June still far less packed than TTC subway. Still plenty growth room, it looked. In the light of very, very, very dissapointing earlier numbers, the good news is 50% farebox recovery has already occured on specific days. – Then subtract 10 dollar average fare payment, you get 10 dollar subsidy. Soon, the 8200/day will be 10000/day average, as the graph momentum suggest plateau will occur above 10,000 riders a day. Not good enough for 2025, but I can live with that for 2017 “on the journey” of fixing UPX economics. This is better than the Sheppard subway (at first), apparently. Unlike Sheppard though, demand has not yet plateaued. A few days ago, I took the opportunity to watch UPX while having coffee at UPStairs at outgoing peak. The pattern is only 1 train was fully sardined like Yonge subway (but none were left behind on platform), the rest was loose-standees and one train had seats. Random, it seemed. There seemed to be room to sardine more trains, as well as longer peak period (3 hours of every train getting standees) which is not yet happening. I remain optimistic that 70% farebox recovery may be doable if simultaneous cost cuts occur. We clearly have no choice but to “live with this” until further mitigations during electrification — where we must press for correct decision being made. Any progress on a link at Dundas West? Sorry to see that there’s been no progress on the link at Dundas West. It can only help ridership. What are they waiting on? Steve: Negotiating with the Crossways owner, I believe.